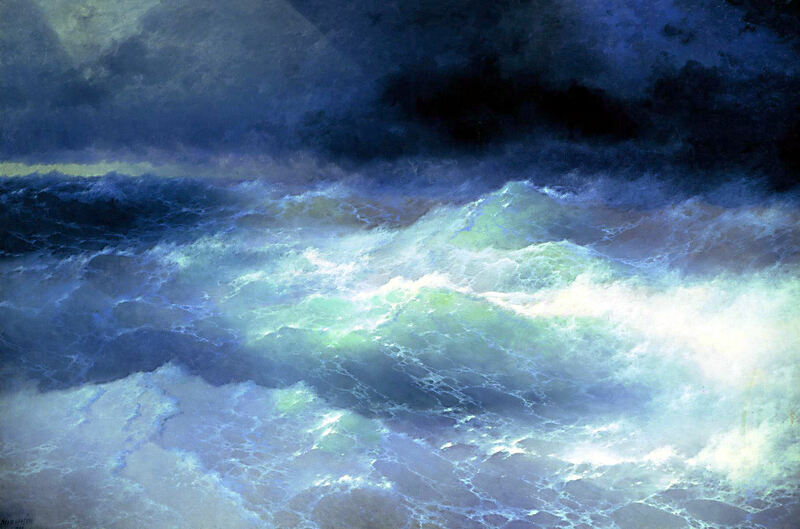 Ivan/Hovhannes Aivazovsky (1817–1900), The Ninth Wave Девятый вал (detail) (1850), oil on canvas, 221 x 332 cm, State Russian Museum Государственный Русский музей, Saint Petersburg, Russia. Wikimedia Commons. Think of nineteenth-century paintings of shipwreck and rough seas, and (if in Europe or America) you’re almost certain to bring to mind JMW Turner. Allow me to introduce the master of marine painting of that period, who must have been one of the most prolific marine artists ever: Ivan Konstantinovich Aivazovsky (1817-1900). If you’d prefer that in Cyrillic, it’s Ива́н Константи́нович Айвазо́вский, or in Armenian, Հովհաննես Այվազովսկի or Hovhannes Ayvazovski. At the time, Aivazovsky was a Russian, who was born of an Armenian family in Feodosia (Theodosia), in the Crimea, which is in the Ukraine – hence the multiple versions of his name. To further confuse, when he was a student he was known in Russian as Ivan Gaivazovsky (Иванъ Гайвазовскій), and when he lived in Italy as Giovani Aivazovsky. Aivazovsky trained at what was then the Imperial Academy of Arts, alongside the Neva River in Saint Petersburg, from 1833 until 1837, and excelled there, winning gold and silver medals. After graduating, he returned to the Crimea for two years. In 1840, he was sponsored by the Imperial Academy to study in Europe. He then travelled overland through Vienna and Berlin to Venice. When in Italy, he visited Florence, Amalfi, and Sorrento, then stayed in Naples and Rome until 1842. During this period he painted many beautiful views of the Italian coast, and of Venice. Ivan/Hovhannes Aivazovsky (1817–1900), The Bay of Naples (1841), oil on canvas, 72.6 x 108.5 cm, The Cottage Palace Museum, Peterhof, Saint Petersburg, Russia. Wikimedia Commons. 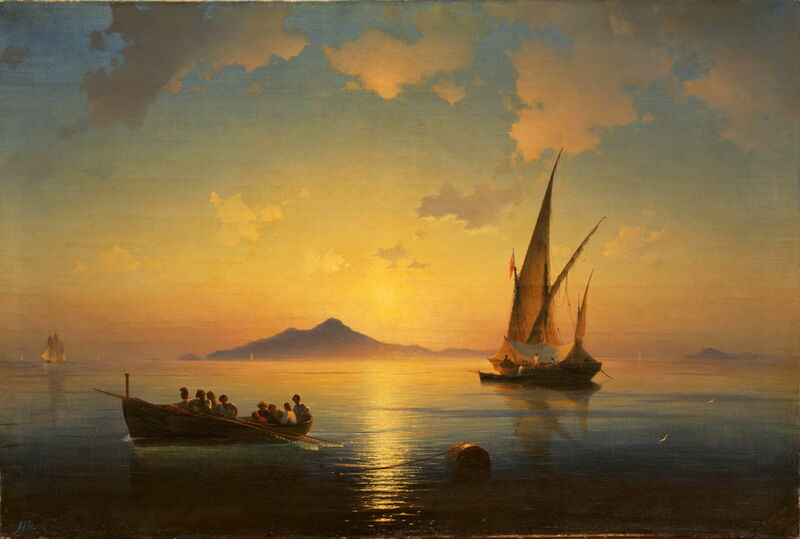 The Bay of Naples (1841) is a good example of his early paintings from Italy, in which he often sought the rich colours of sunrise and sunset. These are not large canvases, but he shows fine details such as the rivulets of water falling from the oars. He started his return to Russia via Switzerland, Germany, the Netherlands, and Britain. While in London, he met JMW Turner, who was particularly impressed by his painting The Bay of Naples on a Moonlit Night. He then travelled to Paris, where he was awarded a gold medal from the Académie Royale, and toured through Europe again in 1843. He finally returned to Russia in 1844, where he was made an academician at the Imperial Academy, and was appointed the principal painter to the Russian Navy. The bulk of his work from the middle of the century is of naval scenes and battles. Ivan/Hovhannes Aivazovsky (1817–1900), Battle of Navarino (1846), oil, dimensions not known, Marine College Высшее военно-морское инженерное училище, Saint Petersburg, Russia. Wikimedia Commons. His painting of the Battle of Navarino (1846) is one of the classic depictions of this major naval battle on 20 October 1827. 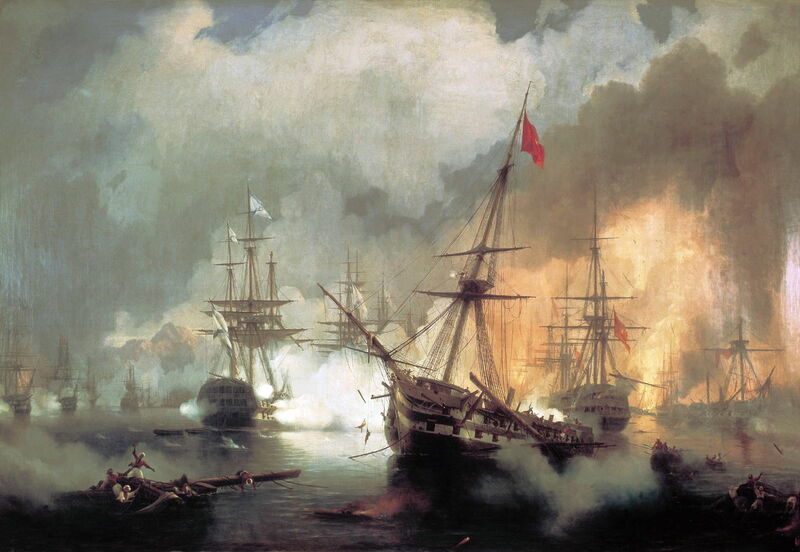 Fought between the combined Ottoman navies and an allied force of British, French, and Russian warships, it was the last major battle between traditional wooden sailing ships, and resulted in destruction of the Ottoman forces. It took place off the Greek coast, in the Ionian Sea, as part of the Greek War of Independence. 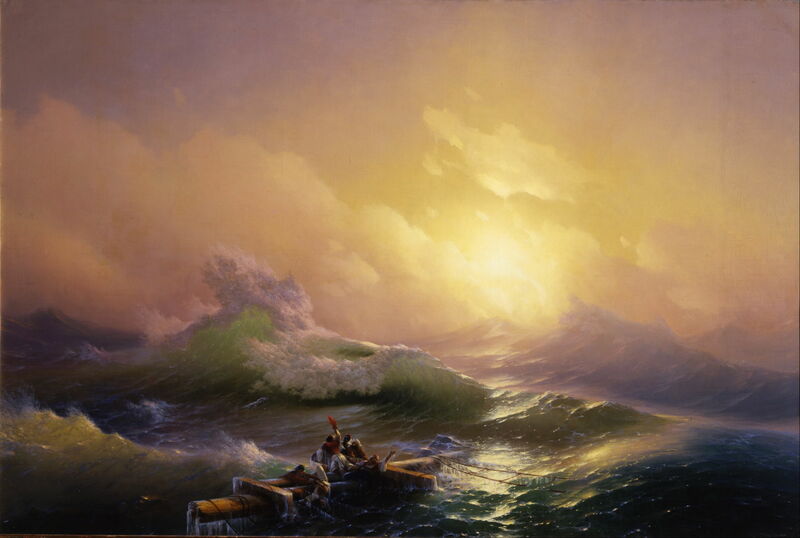 Ivan/Hovhannes Aivazovsky (1817–1900), The Ninth Wave Девятый вал (1850), oil on canvas, 221 x 332 cm, State Russian Museum Государственный Русский музей, Saint Petersburg, Russia. Wikimedia Commons. 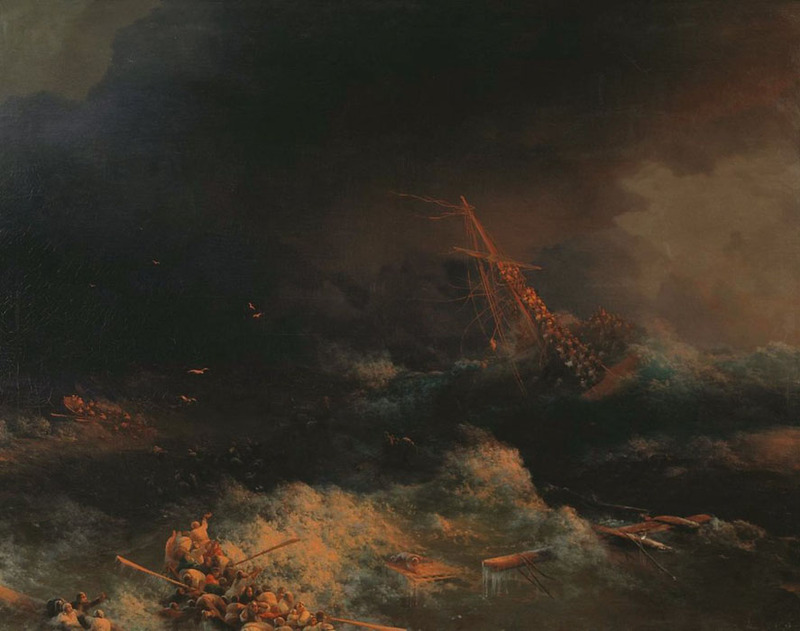 The Ninth Wave (1850) is Aivazovsky’s best-known painting, and one of the classic depictions of shipwreck alongside Géricault’s Raft of the Medusa (1818-19), although not as a social or political statement. Its title derives from the belief that waves occur in trains of nine, progressively increasing in size to the ninth wave. Some nautical traditions claim that the number is seven rather than nine, and although there is some underlying evidence to support wave trains, inevitably real life is not as regular. 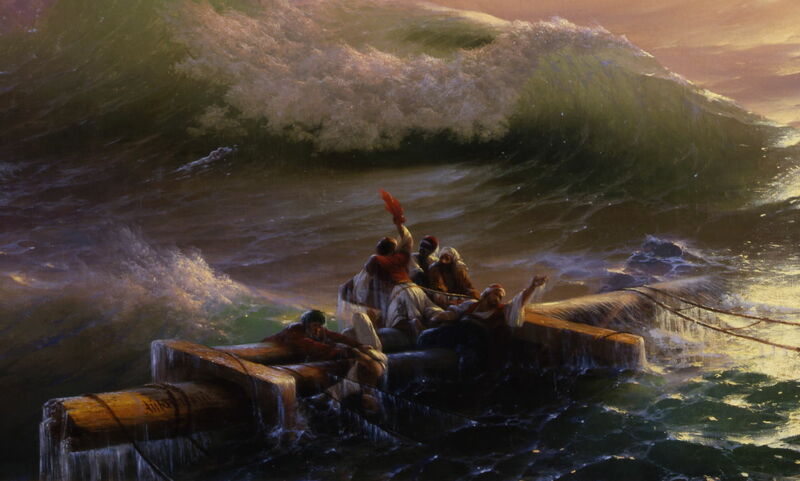 Aivazovsky refers to Géricault’s pyramidal form of the survivors, but has borrowed little else. 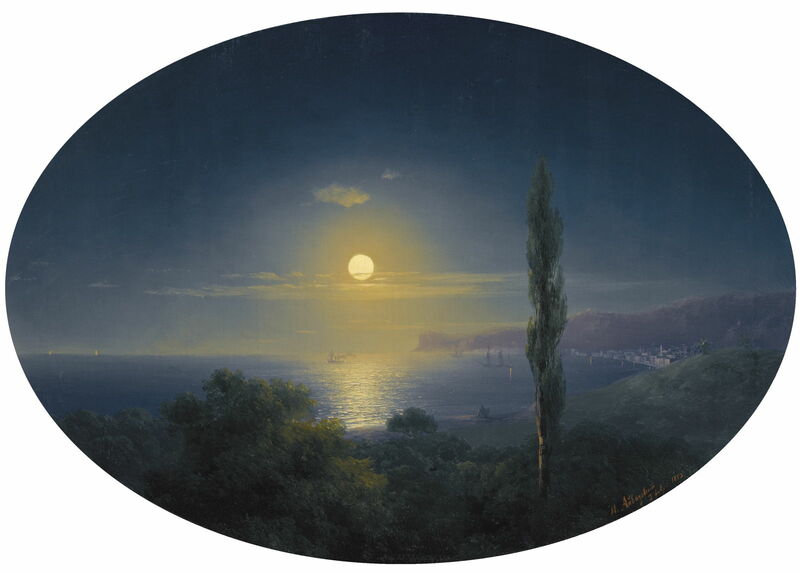 Ivan/Hovhannes Aivazovsky (1817–1900), Crimean Coast by Moonlight Побережье Крыма в лунную ночь (1853), oil on canvas, 40 x 56 cm, Private collection. Wikimedia Commons. When the Crimean War broke out in 1853, Aivazovsky painted from the beseiged fortress of Sevastopol, although he still found opportunity to show its beauty in his Crimean Coast by Moonlight (1853). 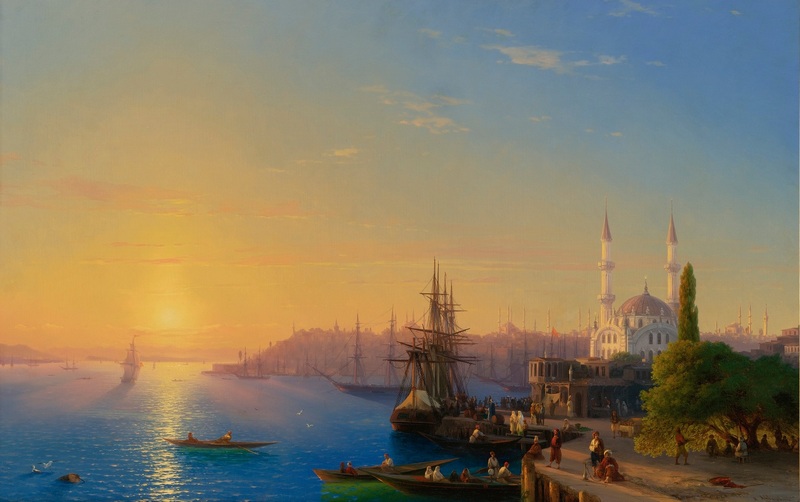 Ivan/Hovhannes Aivazovsky (1817–1900), View of Constantinople and the Bosphorus Вид Константинополя и Босфора (1856), oil on canvas, 124.5 x 195.5 cm, Private collection. Wikimedia Commons. View of Constantinople and the Bosphorus (1856) is one of many views that he made of this great city (now known as Istanbul, of course), which he visited on many occasions. Ivan/Hovhannes Aivazovsky (1817–1900), Broad Landscape with Settlers Широкий пейзаж с поселенцами (1856), oil on canvas, 93 x 145 cm, Private collection. Wikimedia Commons. 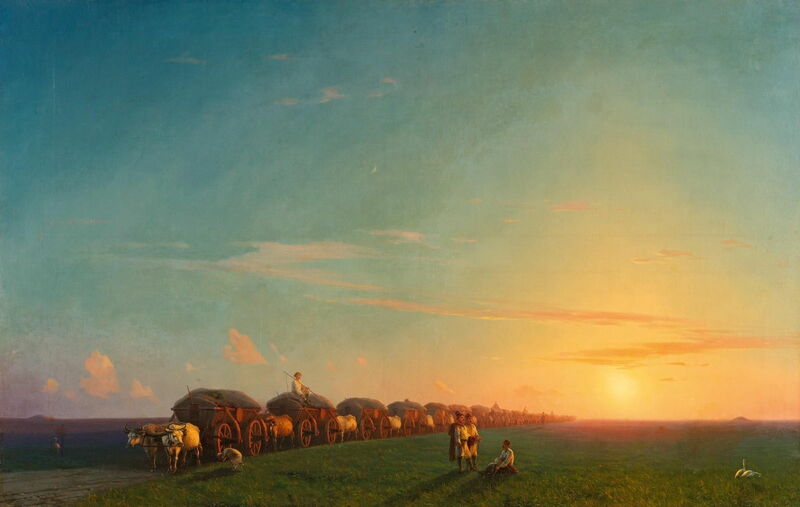 Best-known for his thousands of marine views, Aivazovsky went deeper inland for his Broad Landscape with Settlers (1856). This shows the steppe of Izumskaya, now on the border between Russia and the Ukraine, where ‘salt farmers’ are seen migrating from the crowded lands of the Crimea into the interior of Russia. Aivazovsky lived in Paris from 1856-7, where he was made a member of the Legion of Honour. 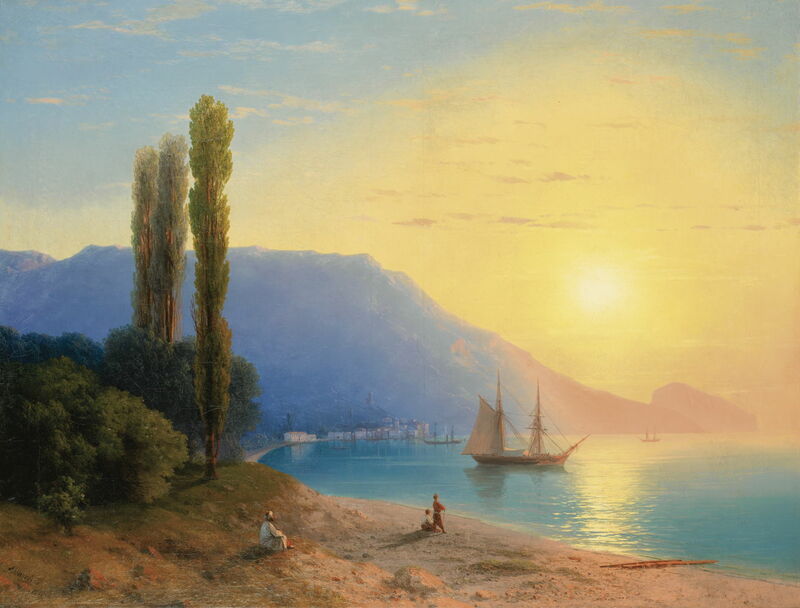 Ivan/Hovhannes Aivazovsky (1817–1900), Sunset over Yalta Закат в Ялте (1861), oil on canvas, 67 x 89 cm, Private collection. Wikimedia Commons. Sunset over Yalta (1861) shows this popular resort city on the southern coast of the Crimean Peninsula. At this time, it was fashionable for the Russian aristocracy and gentry to spend their summers here, and many bought summer homes or dachas for the purpose. 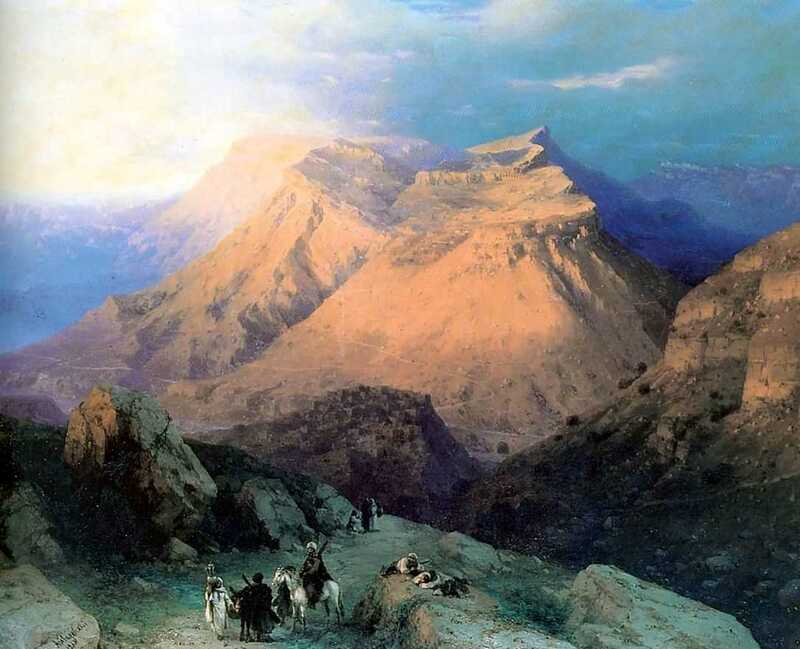 In 1868, Aivazovsky travelled to the Caucasus Mountains, and into Armenia and Georgia the following year. Ivan/Hovhannes Aivazovsky (1817–1900), Tiflis (Tbilisi) (1868), oil, dimensions and location not known. Wikimedia Commons. 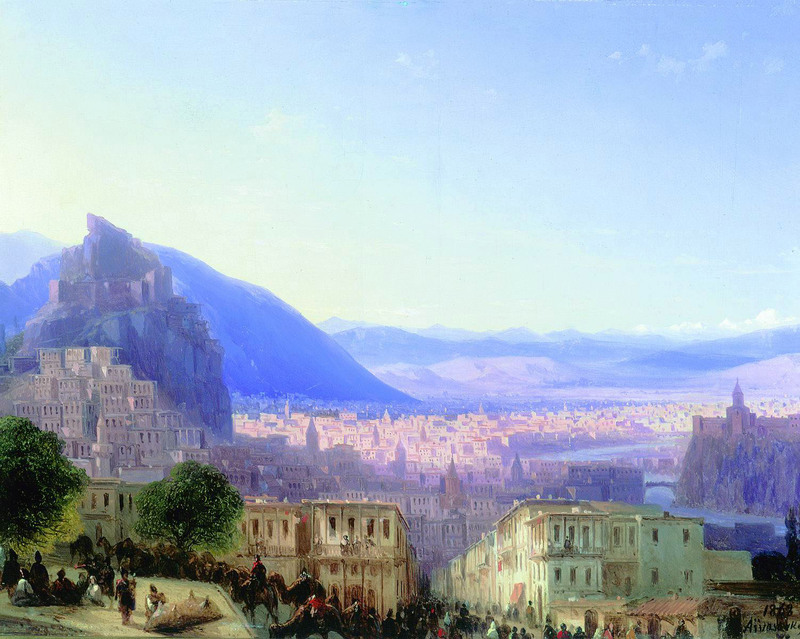 Tiflis (now Tbilisi, the capital of Georgia) (1868) is one of the finest paintings of this cosmopolitan city, showing the camels on its bustling streets, amid the many church towers, and its rugged surroundings, rising to the Caucasus mountains in the far distance. Ivan/Hovhannes Aivazovsky (1817–1900), Mountain Village Gunib in Daghestan, View from the East Аул Гуниб в Дагестане (1869), oil, dimensions not known, State Russian Museum Государственный Русский музей, Saint Petersburg, Russia. Wikimedia Commons. Aivazovsky was an early visitor to the mountainous wilderness of the North Caucasus, where he painted this Mountain Village Gunib in Daghestan (1869). Ivan/Hovhannes Aivazovsky (1817–1900), Moscow in Winter from the Sparrow Hills (1872), oil on canvas, 46 x 72 cm, Private collection. Wikimedia Commons. 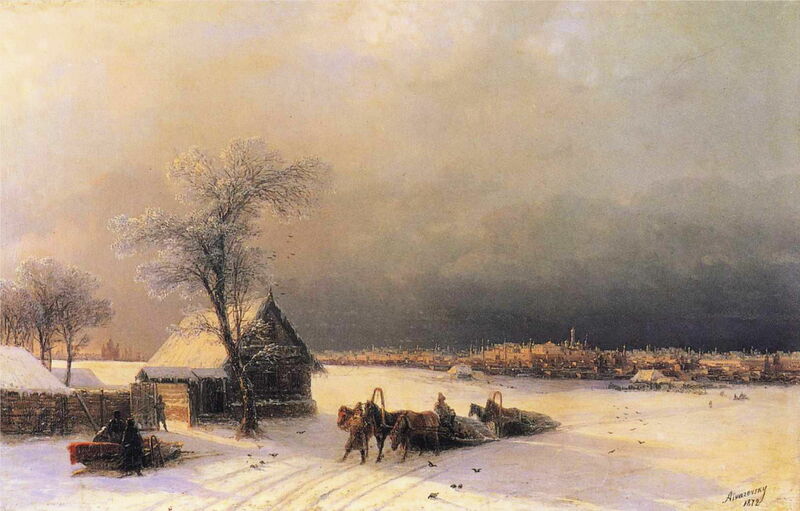 Moscow in Winter from the Sparrow Hills (1872) is one of several views that Aivazovsky painted from this vantage point (in Russian: Воробьёвы го́ры Vorobyovy Gory) on the right bank of the Moskva River, looking towards the city. Ivan/Hovhannes Aivazovsky (1817–1900), Winter Landscape Зимний пейзаж (1876), oil on panel, dimensions not known, Private collection. Wikimedia Commons. 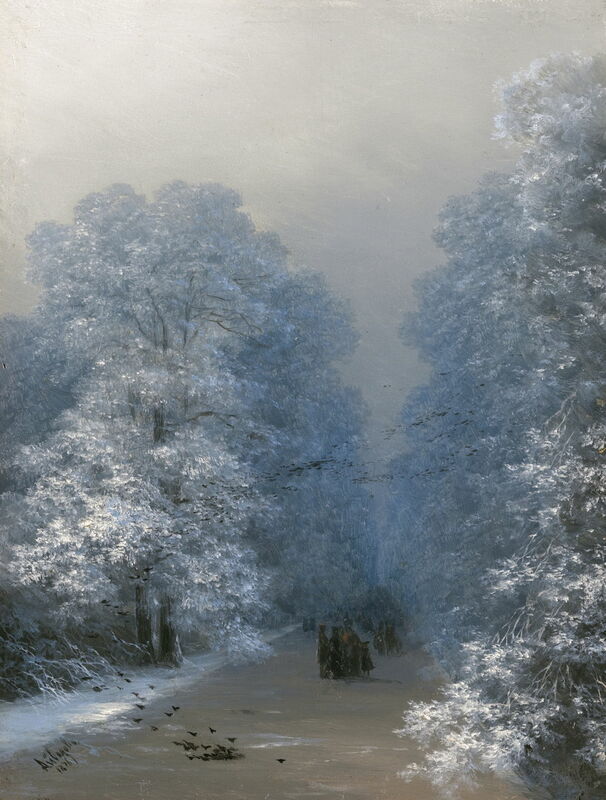 Winter Landscape (1876) is more generic in its location, and its delicate detail in the snow frozen to the trees contrasts with the dense flight of black birds, and the seemingly endless column of walkers. Ivan/Hovhannes Aivazovsky (1817–1900), Loss of the Ship “Ingermanland” in the Skagerrak on the Night of 30 August, 1842 Крушение корабля “Ингерманланд” в Скагерраке в ночь на 30 августа 1842 (1876), oil, dimensions not known, Central Naval Museum Центральный военно-морской музей, Saint Petersburg, Russia. Wikimedia Commons. Loss of the Ship “Ingermanland” in the Skagerrak on the Night of 30 August, 1842 (1876) is a shipwreck painting comparable in content, but not style, to those of JMW Turner. 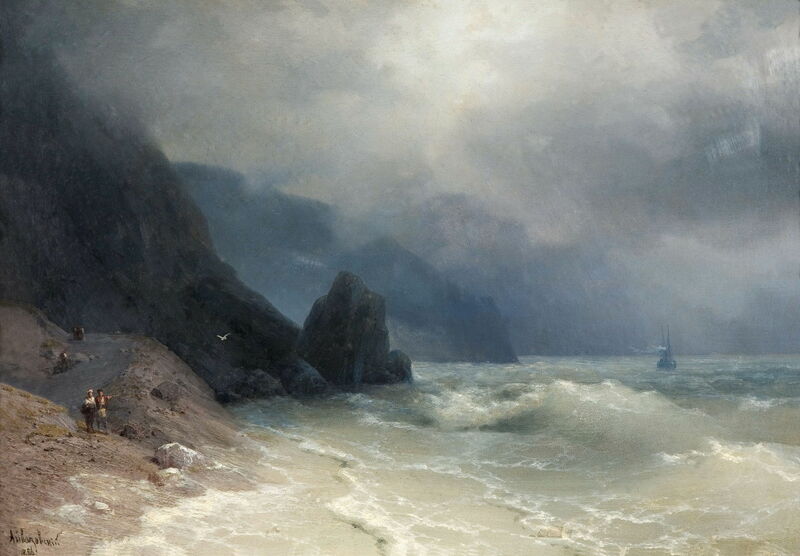 The location of Sea Coast (1886) is not clear, but it shows a rugged coastline with a storm sea pounding at its cliffs. The sole ship has both sails and a steam engine, as was becoming increasingly common at that time. Ivan/Hovhannes Aivazovsky (1817–1900), Descent of Noah from Ararat Сошествие Ноя с Арарата (1889), oil on canvas, 128 x 218 cm, National Gallery of Armenia Հայաստանի Ազգային Պատկերասրահ, Yerevan, Armenia. Wikimedia Commons. 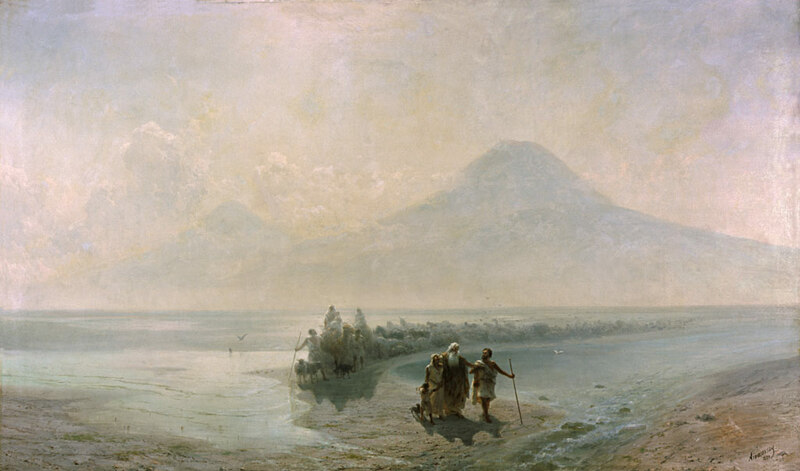 Descent of Noah from Ararat (1889) is one of the finest of the relatively few religious scenes which Aivazovsky painted, and shows Noah with his family and a long train of pairs of animals, following their descent from Mount Ararat, after the Flood had abated. His travels in Europe continued during the 1870s, and in 1892 he visited America, where he painted the Niagara Falls, and some other landscapes. He later retired to Feodosia, his home town, where he died. He is estimated to have painted more than 6,000 works during the 60 years of his career, which is an average of two paintings per week. Although you may never have heard of him before, good examples of his paintings currently fetch more than $1 million at auction. Ivan/Hovhannes Aivazovsky (1817–1900), Among the Waves Среди волн (1898), oil on canvas, 66 x 97 cm, Aivazovsky National Art Gallery Феодосійська національна картинна галерея імені І. К. Айвазовського, Feodosiya, The Ukraine. Wikimedia Commons. Among the Waves (1898) is a late example of Aivazovsky’s favourite subject: the storm sea. Posted in General, Painting and tagged Aivazovsky, Armenia, Géricault, landscape, marine, painting, Russia, Turner, Ukraine. Bookmark the permalink. Sometimes I think I have been walking through life with my eyes closed. How have I missed this artist – The Ninth Wave is staggering! Thank you: I have only recently ‘found’ his work too. Sadly, as few of his paintings are in the West, he seems to have become largely ignored in Europe and America. Great post! Aivazovsky is one of my favorite painters. Thank you for your kind words. Yes, his paintings are superb. It is such a great shame that they are not better-known in Europe and the Americas. I agree! I was lucky enough to visit his house in Feodosia many years ago and then, more recently, see his paintings in St.Petersburg. Simply breathtaking.